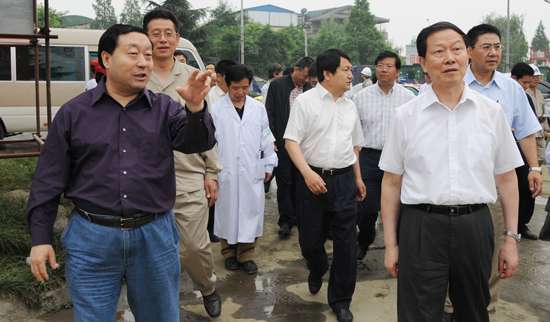 On May 29 morning, state-owned asset supervises the State Council group of be in harmony of Li Rong of administrative committee chairman, in general manager of company of national electrified wire netting Liu Zhenya, Sichuan saves vice-governor Li Chengyun accompany below, will be set in aseismatic front providing disaster relief directs bureau of Chengdu cable industry center, inspect electrified wire netting circumstance of aseismatic progress providing disaster relief, the employee of electrified wire netting of kind and condolatory aseismatic a gleam of providing disaster relief, guidance works next. Li Rong be in harmony was sure system of company of national electrified wire netting is adequately aseismatic each work that place providing disaster relief does. The team member of rush to repair of electrified wire netting with his present encourage and medical treatment team member say, everybody works hard with his, the wind that showed central company staff adequately model. This year early or late in two natural disaster, loss of national electrified wire netting is severe, but fall in the effort of extensive staff, made sure stability of security of electrified wire netting moves. Disaster area people expresses very tall hope to enterprise of electrified wire netting. Face natural disaster, deliver the light of life, net report is ceaseless, uninterrupted, this is the responsibility of enterprise of electrified wire netting. Struggle the employee of electrified wire netting in a gleam of, be worthy of is the first-class staff of central enterprise. Li Rong be in harmony points out, restore to rebuild next working difficulty still very big, it is a protracted battle. Enterprise of electrified wire netting should do good victim to find a place for the power supply of the room works, ensure public security truly where does buy room build, electric power is supplied where to go to, where does safe power supply go to. Want to build electrified wire netting weller than in the past, at the same time help place resolves difficulty, make concerted effort crosses difficulty in all. Liu Zhenya expresses, wide high-ranking official of system of company of national electrified wire netting is versed in scarcely loses great trust, below the right leader of the Party Central Committee, the State Council, go all out in work tenaciously, capture with real operation aseismatic the comprehensive victory that provide disaster relief. Be aimed at current condition and earthquake relief work of below one phases, when did Liu Zhenya put forward to ask: It is to should be established long-term and shock-proof aseismatic thought, cannot paralytic, cannot lax, want to ensure the safe stability of electrified wire netting moves; 2 it is to should have been done " 3 prevent " the job, namely epidemic prevention, prevent ill, shock-proof, want to ensure the life of employee is safe; 3 it is to want those who become family member of good casualties staff to find a place for deal with problems arising from an accident works, do feel better the wounded to be versed in deliverance works, ensure the procession is steady; 4 it is the refreshment that wants ground of be practical and realistic to catch good electrified wire netting rebuilds and scientific and reasonable plan and construction works; 5 it is to should accomplish two tactics to catch, catch aseismatic provide disaster relief, catch production to manage. At present we should be faced with the estivate that greet a peak already, want again aseismatic provide disaster relief, still the Olympic Games defends report, but want prep against difficulty to go up, the task is again formidable also want to finish.